In 1981, Torsten Wiesel shared the Nobel Prize in Physiology or Medicine with his colleague David Hubel for studies of how visual information is transmitted to and processed in the brain’s visual cortex. Their investigations identified specialized functions and mapped the functional architecture of individual cells in the visual cortex. He is currently co-director of the Shelby White and Leon Levy Center for Mind, Brain and Behavior at The Rockefeller University. Dr Wiesel serves as the chair of the Board of Governors to Okinawa Institute of Science and Technology (OIST) Graduate University (since 2009) and is a visiting professor at Karolinska Institutet in Stockholm, Sweden. 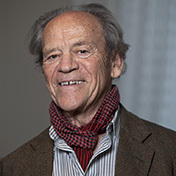 Torsten Wiesel received his MD from the Karolinska Institutet in 1954. His postdoctoral work in ophthalmology was under Stephen Kuffler at The Johns Hopkins University Medical School where he became an assistant professor in 1958. In 1959, he moved to Harvard Medical School, where he remained for 24 years, becoming the Robert Winthrop Professor of Neurobiology in 1974 and serving as chair of the Department of Neurobiology from 1971-1981. In 1983, Dr Wiesel moved to the Rockefeller University as Vincent and Brooke Astor Professor and head of the Laboratory of Neurobiology. He was president there from 1991 to 1998. From 2000 to 2009 Dr Wiesel was secretary general of the Human Frontier Science Program. He served as the chair of the board of the New York Academy of Sciences from 2000-2006 and served on the scientific advisory committee of the Pew Scholars Program. He is a founding member of the Israeli-Palestinian Science Organization and has done much work as a global human rights advocate. He is a founding member of the International Human Rights Network of Academies and Scholarly Societies, and he also served for 10 years as chair of the Committee on Human Rights of the National Academies of Sciences. In 2005, Dr Wiesel was a recipient of the National Medal of Science.